It’s hard to believe that it’s been going on four years since I first reviewed Pago restaurant, after it opened in spring 2009. Time flies. Back then, to be honest, I liked Pago a lot. But, I didn’t love it. Despite a kitchen team that looked strong on paper, some of the dishes at Pago were disappointing. And, there were other small things that nagged at me, like the wine list—despite its eclecticism, I found it lacking. Over the years, I’ve returned to Pago on occasion, and every time I did, I liked the restaurant a little better than the last. Following a couple of recent visits, I thought it was time to update my original review of the restaurant. Improvements have been made. Over time, Pago has become the little restaurant I wanted to love. In the past month or so, I’ve tasted nearly everything on the dinner menu, much of the lunch menu and some of the brunch offerings. Astonishingly, there wasn’t a flaw in the entire bunch. That’s an amazing batting average. Some menu items—like the croque monsieur ($12) from the brunch menu—are such tried & true staples that they’ll probably always be offered at Pago. It begins with high-quality Pierre Bakery bread, grilled with Berkshire ham and bathed in a Mornay sauce, and served with a perfectly poached Clifford Farm egg. Technically, the addition of the egg makes this a croque madame, but since it’s served on the side, I won’t quibble. Whatever you call it, it tastes great. Another item that’s unlikely to ever leave the Pago menu—there’d be riots in the streets if it did—is the Pago burger ($14). It’s such a bodacious burger that Wine Enthusiast magazine featured it in June 2012, along with a recipe. The burger’s ingredients change, depending on what’s fresh and available, but it’s typically a blend of ground chuck, ground short rib and ground brisket—a beef blend that produces a really juicy, flavor-filled burger. It’s topped with Edam cheese, artisan bacon, pickled onion, black-garlic aioli, Dijon vinaigrette and seasonal greens, and served on a brioche bun. It’s crazy good. A delightful (and decadent) starter at Pago is the chicken-liver mousse ($9). Oh, man, I’d like to have this silky stuff administered intravenously, but then I’d miss out on the rich flavor of the chicken livers. Executive Chef Phelix Gardner’s mousse is, quite simply, the best liver mousse I’ve tasted. It comes in a glass ramekin with pickled veggies on the side and cherry mostarda, which you can schmear along with the mousse on a piece of grilled Pierre Bakery baguette. Heaven. During lunch on a blustery winter day, cassoulet ($13) was just the ticket. At Pago, it’s a delicious mélange of white beans with chicken confit, slightly sweet Creminelli sausage slices, carrots and celery, all topped with a crunchy breadcrumb crust. It’s such a simple dish, yet it’s so satisfying. The same can be said of the simple and sensational “Kale Caesar” salad. It’s an interesting twist on the classic Caesar salad, made with chopped kale from Salt Lake’s Frog Bench Farms. To be honest, I had my doubts—but the kale really works. It’s another nice surprise from Gardner, who also oversees the menu and kitchen at Pago’s sister restaurant, Finca. When I complimented Gardner on his clever manipulation of the phrase “Hail, Caesar,” Gardner said, “Hmm, I hadn’t thought of that!” Such is his intense focus in the kitchen. In addition to Gardner, Pago also benefits from the expertise of sommelier Evan Lewandowski. In tandem with owner Scott Evans, Lewandowski has peppered the Pago wine list with a number of very unusual selections, many of which are organic and/or biodynamically produced. For example, he paired the croque monsieur with a surprising Sicilian wine from Mt. Etna mad scientist/winemaker Frank Cornelissen. Susucaru 4 is a Rosé-style wine that’s almost more reminiscent of a Belgian lambic than wine: cloudy with hints of orange and clove. As I said, it’s very unusual, but an excellent, if not obvious, partner for the croque monsieur. Like me, Lewandowski loves good Riesling, so I was thrilled when he suggested J.J. PrÃ¼m Riesling Kabinett to sip alongside Pago’s steelhead trout ($28). This is a lovely dish: steelhead fillet with crispy skin intact, served with local fingerling potatoes, Brussels sprouts, bacon lardons and a clam-chowder nage, with clams scattered around the plate. The Riesling was spot-on with the trout. I’m not a huge fan of horseradish. So, I was a tad doubtful about Gardner’s horseradish gnocchi, which is a key component of his version of beef bourguignon ($24). Well, after tasting a couple of those wonderful little potato pillows, I echoed my wife’s sentiment, which was: “I could eat an entire bowl of that gnocchi!” Lewandowski paired it with another surprising wine choice, an Italian Primitivo like none I’ve ever tasted. Pasquale Petrera Fatalone “Teres” 2009 is more like a heavy, weighty Rosé than any Primitivo or Zinfandel you’ve ever had—a red wine that benefits from a slight chill. As with the horseradish gnocchi, Gardner surprised me with his lamb dish, too. His Morgan Valley Lamb “sugo” is tender, braised lamb that’s cooked with mirepoix and tossed with housemade mint pappardelle ($26). It’s the mint pappardelle that threw me. Mint, of course, is a classic accompaniment for lamb. I, however, think mint belongs primarily in mojitos. I don’t like it, generally. But, again, I was proved wrong. The pappardelle had just the slightest hint of mint. It was, in fact, fantastic—one of the best dishes I’ve had in a while. And then, there are desserts, like the massive Dutch “baby” pancake ($12) with Meyer lemon curd, which four hungry people could easily share. Or white-chocolate bread pudding ($8) with vanilla gelato, perfectly paired with 1997 Cossart Gordon Colheita Bual Madeira. 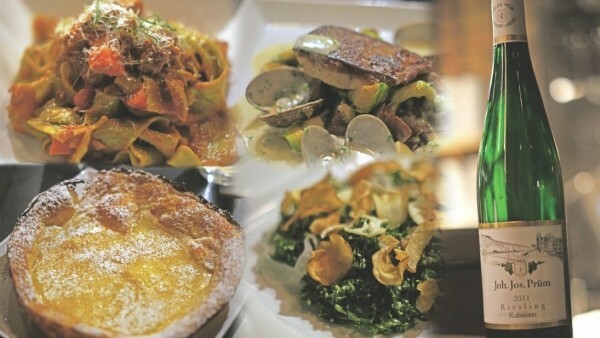 Just add Pago’s excellent service to the mix, and you’ve got an outstanding local eatery that’s easy to love.